The above image, and the higher resolution section from it seen below, was taken on 19 May 2012 at the G8 Summit at Camp David, Maryland. 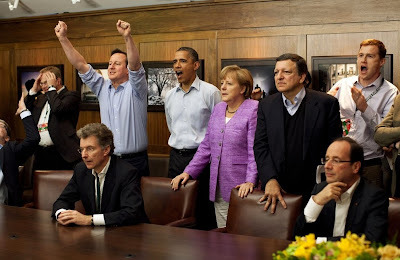 These World leaders are watching the penalty shootout (tied 1-1 in regulation) in the final match of the 2012 Union of European Football Associations (UEFA) Championship between the London-based Chelsea Football Club vs. the favored FC Bayern Munich. Contrasting their body language and the look on their respective countries leaders' faces tells the whole story. With his arms & hands lifted high, the U.K.'s Prime Minister David Cameron expresses vicarious fiero at Chelsea's 4-3 shootout win. 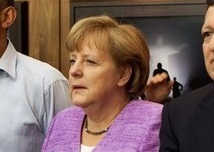 Angela Merkel's normally hyper-expressive face displays more subtle body language in this photo. Her eyelids are partially closed in a particular configuration and in this cluster-context are indicative of subtle anger (think of Clint Eastwood in "The Good, the Bad and the Ugly"). Unlike the partial closure which accompanies a sincere smile, with this anger nonverbal, there are no dynamic, concave-up furrows seen in her lower lids. Interestingly, Barack Obama, standing between Cameron and Merkel, is both the leader of this G8 Summit and also friends with David. While his obvious vocalization shows his partiality to Chelsea FC - we can see he's experiencing emotional dissonance - for his hands are self-restrained behind his back as his subconscious attempts to maintain some level of neutrality so as not to offend Angela. Analysis # 351: Some Subtle and some not-so-subtle signs of anxiety, discomfort, anger, fear, etc.